figures as Louis Brandeis, Albert Einstein, Franz Boas, Nathan Glazer, and Chomsky. Barsky describes Harris's work in language studies, and his pioneering ideas about discourse analysis, structural linguistics, and information representation. 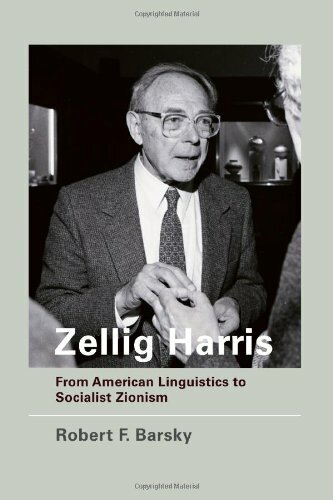 He also discusses Harris's part in the pre-1948 Zionist movement-;when many Jews on the Left envisioned a socialist Palestine that would be a haven not only for persecuted Jews but also for disenfranchised Arabs and anyone seeking a sanctuary against oppression-;and recounts Harris's debates on the subject with Brandeis, Einstein, and a large group of students involved with a Zionist organization called Avukah. And Barsky describes Harris's views on capitalism, worker-owner relations, and worker self-management, the legacy of which can be found in some of his students' writings, notably those of Seymour Melman. Barsky shows how Harris, as mentor, teacher, and colleague, powerfully influenced figures who came to dominate the twentieth century's political discussion-;thinkers as different as Noam Chomsky and Nathan Glazer.